Researchers are excited about a new, potentially habitable exoplanet orbiting our closest stellar neighbor, Proxima Centauri. There’s a new, rocky exoplanet in the neighborhood, and its name is Proxima b.
Exoplanets may seem to be a dime a dozen these days—Kepler alone has racked up more than 2000 exoplanet detections—but there are some extraspecial things about Proxima b. For one, it orbits our nearest stellar neighbor, Proxima Centauri, a red dwarf about 4.2 light-years away. It’s also at least 1.3 times the mass of Earth and orbits in Proxima Centauri’s “habitable zone,” where liquid water could exist, according to a Nature paper published 24 August. Proxima b is not only the closest terrestrial planet known; “it’s the closest planet outside our solar system that will ever be found, because there is no star closer to our solar system,” said Ansgar Reiners, a coauthor on the new paper and astrophysicist at Georg August Universität Göttingen in Germany. Using data from ground-based telescopes at the European Southern Observatory (ESO) in Chile, the team found Proxima b by looking at the subtle ways it affects the movement of its star, or its “Doppler wobble.” This effect occurs when an object projecting sound or light waves moves toward or away from its observer, affecting the way the observer perceives the sound or light waves. When the object moves away from the observer, it seems to give off longer wavelengths, and the wavelengths seem shorter when it comes toward the observer. While observing Proxima Centauri, the researchers noted that on a periodic basis, the star’s light spectrum shifted toward red—or longer wavelengths—and then toward blue, or shorter wavelengths. This Doppler wobble indicated that an exoplanet might be pulling on the star ever so slightly. In fact, the team calculated that Proxima Centauri approaches Earth at 5 kilometers per hour and then recedes at the same speed over a period of 11.2 days. This 11-day cycle represents the exoplanet’s short orbit around its star. Guillem Anglada-Excudé, an astronomer at Queen Mary University of London and lead author on the paper, thought he had caught this planet several years ago after analyzing data collected from ESO’s telescopes in 2000–2008, but he wasn’t convinced. Further observations during the first half of 2016, using ESO’s High Accuracy Radial Velocity Planet Searcher, convinced Anglada-Excudé and his team that they had an exoplanet. The research was part of the Pale Red Dot campaign, a program that searches for exoplanets around Proxima Centauri while connecting science to the public. Earlier this month, rumors flew around the Web, based on an anonymous tip received by the German weekly news magazine Der Spiegel, that the planet was Earth-like and potentially habitable. 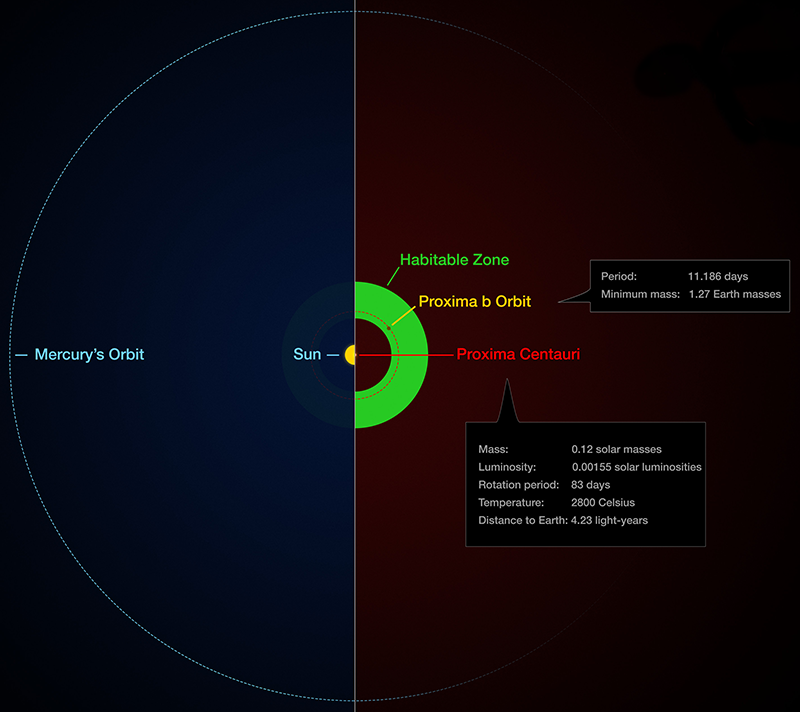 Proxima Centauri is only 0.15% as bright as our Sun and only 14% as large, but because the exoplanet orbits so close—at 5% of the distance between Earth and the Sun, a tighter orbit than Mercury’s—it is smack-dab in the star’s habitable zone, the place where any existing water could be liquid. Not only is the exoplanet’s size similar to Earth’s, it’s also thought to be rocky like Earth, given its relatively small size. However, that’s where the comparisons end. Whereas Earth rotates and receives sunlight on all sides, the new exoplanet’s close proximity to its host star suggests that it’s tidally locked—meaning that one side always faces the star, giving it a constant dayside and constant nightside. Although this doesn’t necessarily rule out habitability, the researchers aren’t even sure the planet has an atmosphere, much less one that could support life. Further, because of its closeness, Proxima b is much more vulnerable to the star’s onslaught of solar flares and X-ray radiation. Although the paper notes that Proxima b receives as much as 400 times the amount of X-ray flux from its star than we receive from ours, in a press conference on 23 August the researchers noted that a more typical flux could be only 100 times more—good news for potential habitability. It might be more accurate to say that the exoplanet resides in the star’s “temperate zone”—as in, it’s the right temperature for hosting liquid water. It might be more accurate to say that the exoplanet resides in the star’s “temperate zone”—as in, it’s the right temperature for hosting liquid water, explained Artie Hatzes, an astronomer at the Thuringian State Observatory in Tautenburg, Germany, in an accompanying News & Views article. Hatzes was not involved in the research. However, the existence of an atmosphere and liquid water depends on the system’s history, Reiners said, and many different formation scenarios lead to different outcomes. For instance, if the exoplanet formed out of material from far away, where it could have picked up ice, the planet could currently have water on its surface. Another scenario says that if Proxima Centauri was more active in its primitive years, its solar flares could have stripped the planet of an atmosphere. Right now, these scenarios are all speculation, the researchers noted. Despite the habitability debate, “the discovery proves that planets with certain characteristics similar to Earth are literally everywhere—including the nearest star to our solar system,” said Daniel Huber, an astrophysicist at the University of Sydney in Australia who wasn’t involved in the research. Most of our understanding of exoplanets comes from those too far away to study in great detail, Huber said. For example, in 2015, scientists confirmed that another planet, Kepler-186f, also orbits its sun in the habitable zone. However, that planet is 500 light-years away. The fact that scientists have “already found a near-Earth-mass planet orbiting the star closest to our Sun demonstrates that we have only started to scratch the surface of exploring planets in our solar neighborhood,” Huber said. Correction, 7 September 2016: The caption of the first image has been modified for clarity. Citation: Wendel, J. (2016), Closest ever terrestrial exoplanet found, habitability debated, Eos, 97, https://doi.org/10.1029/2016EO058083. Published on 24 August 2016.